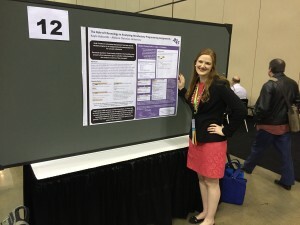 This month, Junior Computer Science major Kayla Holcomb presented her research at the Special Interest Group on Computer Science Education Symposium (SIGCSE) and won first place in the undergraduate research division. Over the last two years, I have been working with Dr. Pettit on automated assessment tools research. We have existing tools here in which students submit programs for feedback and grading purposes and are then given automatically-generated feedback and grades. For Dr. Pettit, this was part of his doctoral research. In our survey of the existing automated assessment tools, we found that the tools were lacking the ability to look at the process that a student takes from the beginning of an assessment to their final submission. Instead, most of the tools required the student to work on their own and turn it in after they have revised and edited it. We wanted to see step by step how the students go about solving a problem when they can’t get feedback from a tool. We wanted to find out how they solved it in sort of a testing environment. I built a simple auto-assessment tool that creates an environment where the student is working in the environment and we are taking snapshots of their works at different intervals. Then, we have this database full of all their work and time stamps and we can look back and see how they progressed. We can take it a step further and see when they first reached certain conceptual milestones. In other words, when was the first time that they achieved this step that we think is crucial to the assessment? We used that, plus the order in which the students organized themselves to work on the solution, to make certain assessments such as how well the student is understanding the concepts and how well the class understands the concepts. 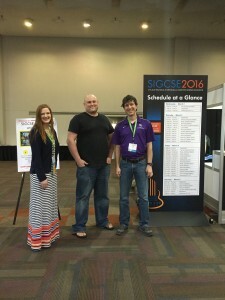 What did you enjoy about SIGCSE? I had no idea what to expect going into the conference. There were computer science educators from all over the world. These were professors, some of which have multiple doctorates, who have more published papers than I can count. These were people whose work I have read and that are very well known in the computer science world. There were also people like me: students trying to learn as much from these professionals as possible to go forward in our own careers. 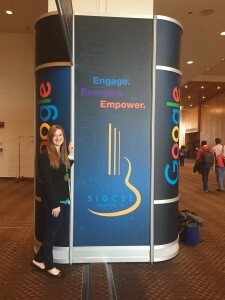 It was really neat to see other people who shared the same interests as mine; other girls in computer science education that are focusing in research. I got to see what other schools were working on. I think I learned just as much from them as I did the professors. One great thing about the conference was that my research was being seen by all of these industry professionals. They were coming up to me and having conversations with me about my research and how my research applied to their research. I was able to make connections that I would have never had the opportunity to make any other time. I met people who are looking for undergrad students to be in their masters programs and doctoral programs. 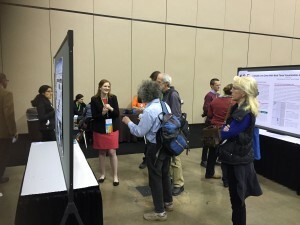 At the same time, I got to see a lot of other research. I got to see a lot of presentations and go to fantastic workshops. This conference was something I don’t think a class could replicate. I was very excited for this opportunity and I would definitely do it again. 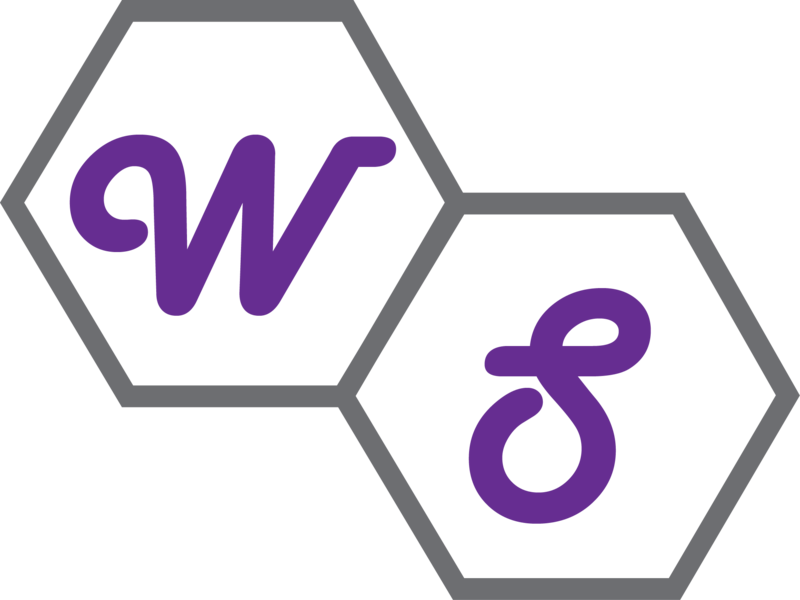 Wildcat Software is the newest student-run organization by Wildcat Ventures. SITC students provide custom software solutions for various clients. It started two years ago and has acquired clients such as a local Abilene museum and vote.acu. Brandon DeLano, advisor for Wildcat Software, explains: “This opportunity allows students to get real-world experience doing software development, project management, and the overall process of running a technical company. It is designed to fill in the holes you don’t get in your undergraduate education”. This organization is truly student-run. Connor Steinmentz, senior Information Systems and Management major, is the CEO. He is in charge of oversight of the company, hiring students, contacting clients, and maintaining communication with Wildcat Ventures. As he heads to USAA after graduation to work as an iOS developer, Connor reflects on how beneficial working with Wildcat Software has been. “This opportunity has allowed me to gain real-world experiences and do something that matters to people.” Brandon DeLano continues, “Any of the smart business decisions- it’s all happened because of the students. I have only provided a little technical advice and direction. Otherwise, they have made it their own thing”. Though still in its growing stage, Wildcat Software is proving to be a great experience for students. It is definitely an opportunity all SITC students should take advantage of. For more information and information on how to apply, email Brandon DeLano at bcd13a@acu.edu. I have an Associate’s degree in Secretarial Science from a small Christian college in Dallas. Some would also say I have an MRS degree. It’s varied. I have worked in banking, I’ve worked at an elementary school, and I’ve even worked in a psychiatric hospital. But it has always been administrative assistant type things. I have also worked in property tax consulting and I worked at a nonprofit (211 here in town). I am the administrative coordinator for the Management Sciences department and the School of Information Technology and Computing. 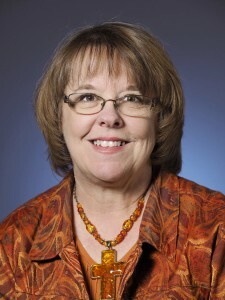 I am also the degree plan specialist for the School of Information Technology and Computing. It really is the students; getting to know them, getting to know their stories, where they’re from, and where they’re going. I love to do all kinds of crafty type things: painting, drawing, sewing, refinishing furniture, singing, and playing guitar. In my last job, I was the coordinator for a brand new program. I worked at 211 Texas, which is a call center for when you don’t know who else to call. If you’re looking for either help with some groceries, or you need help with your rent, or you need help with your light bill, we provided those resources. They had begun to see that there were people who called them every month. They knew that there was something deeper going on; those were just symptoms of what was actually happening. I was hired to come in and work with those individuals and get to what was really going on and what was really holding them back. Was it a lack of education, was it some sort of family or relationship issues that just kept them in this cycle? They were really rewarding to work with. There are 2 or 3 clients that, still to this day, if I run into them, will say, “What you did changed my life”. That just makes going to work every day fun and gives me meaning. My husband’s job is with a nonprofit. We live in a friendship house, which is a part of a nonprofit called Connecting Caring Communities. We live just north of Hardin-Simmons University, but our house is intentionally set in an older neighborhood. It is a neighborhood that has been declining in years, so crime is starting to creep in. There are a lot of transient rental houses, so people come and go. The neighborhood is not as strong as it used to be. His job is to come in and help neighbors get to know one another. If you know your neighbors, your neighborhood will be a better place. Because I live in the house, I am a part of it. We just had a big Halloween party at the house. We have potlucks at our house twice a month for neighbors and we are going to have Thanksgiving at our house for neighbors. It is almost like a church and our house is the building. We are reaching out to people, bringing them in, and getting to know them. Everyone has value and everyone has things that you can learn from. That is the whole idea. It is not that we are trying to save the neighborhood; we are here to be friends, see what we can learn from each other, and how we can enrich each other’s lives. I know this is a corny answer, but it’s Jesus. I had a business professor who always said “your job is to make your boss look good”. That has always just stuck with me. So what can you do to make your boss look better in their role? If that means going in and straightening their desk every morning because they are a messy person, then that is what you need to do. Everyone’s boss is different and everyone needs different things. She taught me a lot. She used to say that the first six letters in secretary are secret. A secretary has to keep secrets because you see confidential things all the time and if your boss can’t trust you to keep things private, then they can’t trust you with anything. I would be invisible. I’d love to be a fly on the wall. I would love to sit in on meetings I’m not supposed to sit on and be able to see people when they think no one is watching. Be proactive. Don’t sit around and wait for things to happen. Sometimes you have to be the one to start something; you have to take the first step. I’m really bad about sitting around and waiting. I’ve learned that nothing good comes from that. Nobody ever gets ahead or succeeds by waiting for things to happen. That can be true in classwork. It is very true for advising and your degree plan. You have to stay on top of it or you’ll be here six years, which isn’t the plan. Be your own advocate.